This article is about the rugby union competition. For the rugby league competition formerly known as National League One, see Championship (rugby league). 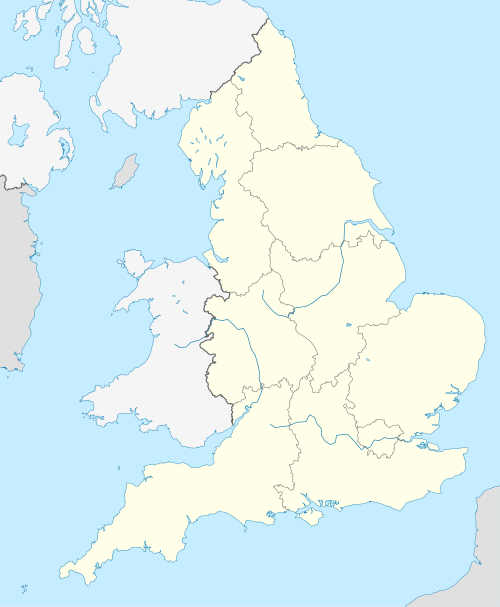 National League 1, (which was known before September 2009 as National Division Two), is the third level of domestic rugby union competition in England. It was known as Courage League National Division Three when founded in 1987. This is the lowest level of the English rugby union league system which is nationwide. The league consists of sixteen teams with all the teams playing each other on a home and away basis to make a total of thirty matches each. There is one promotion place and three relegation places. The champions are promoted to the Greene King IPA Championship and the bottom three teams are relegated to either National League 2 North or National League 2 South (formerly National Division Three North and South) depending on the geographical location of the team. Twelve of the sixteen teams participated in the preceding season's competition. The 2017–18 champions, Coventry, were promoted to the 2018–19 RFU Championship, swapping places with bottom club, Rotherham Titans, who were relegated from the 2017–18 RFU Championship. Sides relegated from the 2017–18 National League 1 included Fylde and Hull Ionians (both National League 2 North) and Old Albanian (National League 2 South). Teams promoted into the division include Cinderford and Sale FC, champions of 2017–18 National League 2 South and 2017–18 National League 2 North respectively, along with south runners up Chinnor who defeated the north's Sedgley Park in the promotion play-off. Cinderford are returning to National League 1 after an absence of two seasons, while Sale FC and Chinnor are both playing at the highest league level in their history. When the rugby union leagues were introduced in 1987 the division was known as Courage League National Division Three. Ten years later, in 1997, the league was restructured and the Premiership was introduced, which consisted of the top two divisions. Therefore, National 3 became the top league outside of the Premiership structure, and was renamed as National 1. In 2000–01 the Premiership was reduced to a single division and National 1 was renamed National 2. Following the formation of the professional RFU Championship in 2009 the league, once again, became known as National League One, and is currently the lowest tier that is nationwide. The league previously consisted of fourteen clubs, but from 2009–10 increased to sixteen. Only one team is now promoted to the RFU Championship and since 2009–10 three teams are relegated to National League 2 North and/or National League 2 South depending on geographical location. Note that all records are from 1996–97 season onwards as this is widely held as the dawn of professionalism across the English club game. It also offers a better comparison between seasons as the division team numbers are roughly equal (for example when league rugby union first started in 1987–88 the Courage League National Division Three had only 12 teams playing 11 games each, compared to 16 teams in 1996–97 playing 30 games (home & away)). Attendance records are from 2000 onwards unless otherwise specified. All records are up to date up till the end of the 2017–18 season. As of the end of the games of 12 May 2018. Stats taken from 1996–97 season onwards and include regular league games only in National League 1 (no cup games). Points scored includes tries, drop kicks, penalties and conversions. As of the end of the games of 12 May 2018. Stats taken from 1996–97 season onwards and include regular league games only in National League 1 (no cup games). ^ Sheffield, Leeds, Liverpool St Helens, Clifton, Aspatria, Askeans, Broughton Park and Plymouth Albion were the relegated teams. The large number of relegations was due to the restructuring of the league system for the 1993-94 season. ^ Rugby and Rotherham were also promoted. ^ London Welsh and Rugby were also promoted. ^ Only 2 teams relegated at the end of the 2016-17 season instead of 3 due to London Welsh being expelled from the RFU Championship in January 2017. ^ Penzance & Newlyn are now known as the Cornish Pirates. ^ Note that due to poor attendance keeping by press and online sources means that the 2000–01 and 2003–04 seasons are excluded from these statistics due to lack of information expect in the case of lowest recorded league game attendance. ^ Stephen Jones, ed. (1988). Rothmans Rugby Union Yearbook 1988–89. London: Rothmans Publications Ltd.
^ a b "Coventry 38 Hull Ionians 21". Coventry RFC. 28 April 2018. ^ "Titans officially relegated after defeat". Rotherham Advertiser. 24 March 2018. ^ "Brave Old Albanian lose battle with National One drop after Plymouth Albion loss". Herts Advertiser. 26 April 2018. ^ "Brave Bury push champions Cinderford all the way in a thriller". East Anglian Daily Times. 22 April 2018. ^ "Sale FC crowned champions, Blaydon suffer back to back relegations". NCA Rugby. 30 April 2018. ^ "National Leagues". The RUGBYPaper (503). Rugby Paper Ltd. 6 May 2018. pp. 26 & 30. ^ Stephen Jones, ed. (1988). Courage Leagues 1988–89. London: Queen Anne Press. ISBN 0356158845. ^ a b Tony Williams and Bill Mitchell, ed. (1990). Courage Clubs Championship. Official Rugby Union Club Directory 1990–91. Horsham: Burlington Publishing Co Ltd. ISBN 1873057024. ^ Stephen Jones, ed. (1991). Rothmans Rugby Union Yearbook 1991–92. London: Queen Anne Press. ISBN 0356202496. ^ "Courage Club Championship 1991/92". Moseley Rugby club. Retrieved 22 June 2013. ^ "Courage Clubs Championship-1992/93". Moseley Rugby Club. Retrieved 22 June 2013. ^ "Courage Clubs Championship 1993/94". Moseley Rugby Club. Retrieved 22 June 2013. ^ "Courage Club Championships 1994/95". Moseley Rugby Club. Retrieved 22 June 2013. ^ Mick Cleary, ed. (1996). Rothmans Rugby Union Yearbook 1996–97. London: Headline Book Publishing. ISBN 0747277710. ^ Mick Cleary, ed. (1987). Rothmans Rugby Union Yearbook 1997–98. London: Headline Book Publishers. ISBN 074727732X. ^ "1997/98: Jewson National Division (formerly Courage League National Division 3)". Moseley Rugby Club. Retrieved 22 June 2013. ^ Mick Cleary and John Griffiths, ed. (1999). Rothmans Rugby Union Yearbook 1999–2000. London: Headline Book Publishing. ISBN 0747275319. ^ Stephen McCormack, ed. (2000). The Official RFU Club Directory 2000–2001. Harpenden: Queen Anne Press. ISBN 1852916273. ^ a b Stephen McCormack, ed. (2001). The Official RFU Club Directory 2001–2002. Harpender: Queen Anne Press. ISBN 1852916400. ^ Stephen McCormack (2002). The Official RFU Club Directory 2002–2003. Harpenden: Queen Anne Press. ISBN 1852916451. ^ "National Division 1 2003/04". Moseley Rugby Club. Retrieved 22 June 2013. ^ "2004/05: National League 2". Moseley Rugby Club. Retrieved 22 June 2013. ^ "2005/06: National League 2". Moseley Rugby Club. Retrieved 21 July 2013. ^ "2006/07: National League 2". Moseley Rugby Club. Retrieved 21 July 2013. ^ "2007/08: National League 2". Moseley Rugby Club. Retrieved 15 August 2013. ^ "2008/09: National League 2". Moseley Rugby Club. Retrieved 15 August 2013. ^ "2009/10: National League 1". Moseley Rugby Club. Retrieved 15 August 2013. ^ "Final League Tables 2010 – 2011". Trelawneys Army. Retrieved 15 August 2013. ^ "English National League One Table". BBC. Retrieved 15 August 2013. ^ "SSE National League 1". NCA. Retrieved 8 May 2014. ^ "London Welsh: RFU refuses permission for Exiles to stay in Championship". BBC Sport. 24 January 2017. ^ "Jewson National League 1 1998/99". rugbyarchive.net. Retrieved 9 January 2016. ^ "National One All time leading scorers". Rugby Statbunker. 29 April 2017. ^ "Team news for tomorrow – Coventry Rugby". www.coventryrugby.co.uk. Retrieved 12 November 2017. ^ "National One All time try scorers". Rugby Statbunker. 29 April 2017.